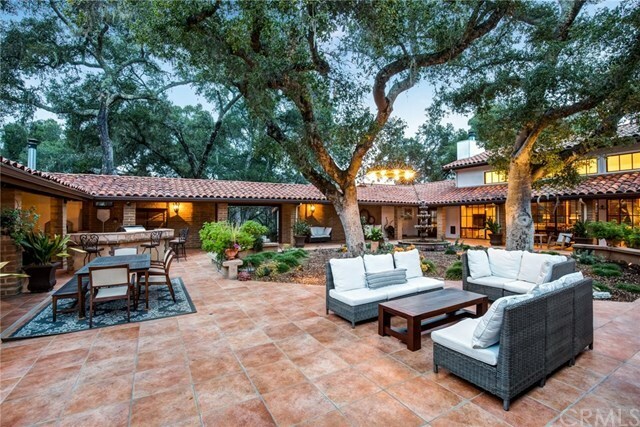 Set amongst the oak trees of the Western hills of Atascadero, this is the hacienda you have been dreaming of. Step through the solid wood entry doors to an enormous, window lined great room and your breath will be taken away by the views of the 4,200+ square foot interior courtyard. An oversized fireplace offers a warm hearth to inspire conversation. Floor to ceiling windows throughout the home to bring the courtyard views in to every room while beautiful plantation shutters ensure privacy. Each section of the home has direct access to the courtyard via French doors that just beg to be thrown open to create the ultimate indoor/outdoor venue as you entertain on the long summer nights. A cavernous pizza oven, built-in charcoal grill, propane burner and more create the focus in the courtyard. Beyond the great room is a stunning master suite, featuring valley views stretching from Templeton to Paso Robles and the hills far beyond. The wardrobe is absolutely breathtaking, featuring solid wood doors concealing generous amounts of storage. The chefâs kitchen is spaciously appointed, wowing guests with expanses of limestone countertop and incredible appliances from Sub-Zero, Jenn-Air, Dacor and Bosch. Home automation options including a Lutron lighting system, EcoBee thermostats to control the independent climate control for the homeâs separate wings and a Ring system all contribute to the casual elegance. A wholly owned photovoltaic system dramatically reduces electric costs.